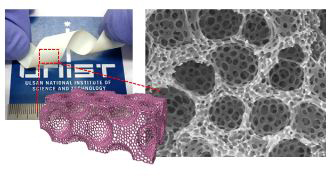 A team of UNIST researchers invented a revolutionary seperator membrane for high-performance rechargeable batteries. From left are Prof. Seungmin Yoo (Ulsan College), Prof. Sang-Young Lee (UNIST), Prof. Soojin Park (UNIST), and a combined master's and doctoral student, Jung-Hwan Kim (UNIST). A major study of advanced membranes for energy applications by researchers at UNIST introduced a revolutionary separator membrane for high-performance rechargeable batteries that are fast-charging, long-lasting, and inexpensive. The findings appear in the July 24 issue of Science Advances, co-authored by Prof. Soojin Park (School of Energy and Chemical Engineering, UNIST), Prof. SangYoung Lee (School of Energy and Chemical Engineering, UNIST), research scientist JungHwan Kim (Department of Energy Engineering, UNIST), and Prof. Seungmin Yoo (Department of Energy and Chemical Engineering, Ulsan College), and two others. 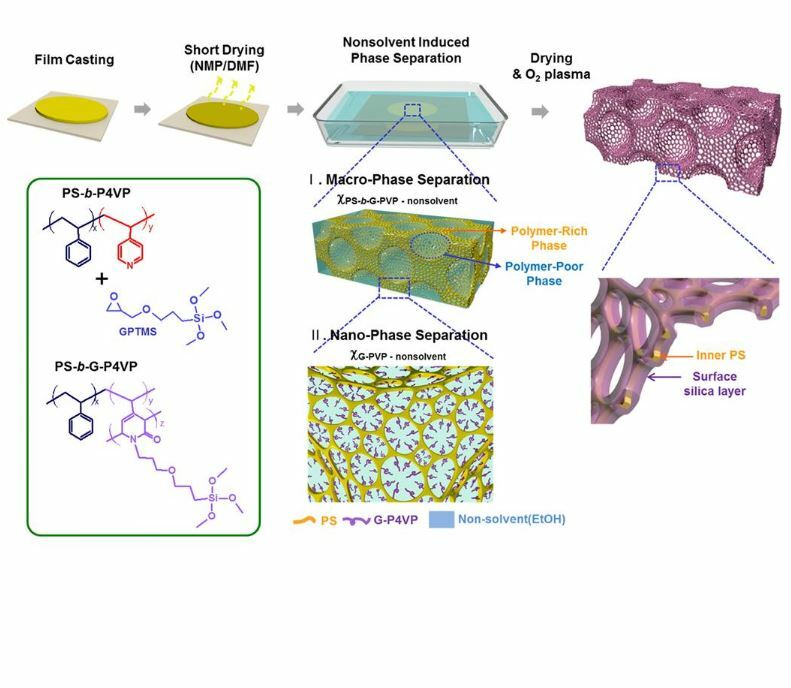 Block copolymer(BCP)-based porous membranes featuring hierarchical multiscale porous structures. 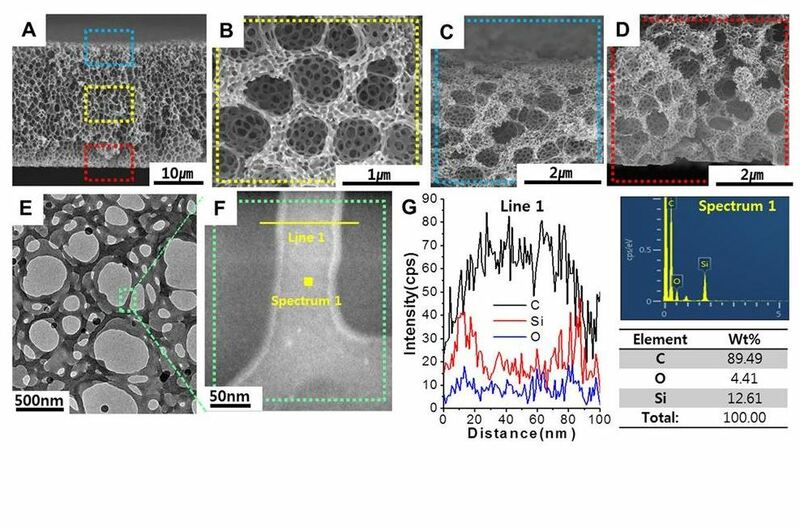 The uniformity of the pore sizes and morphology of the seperator play an important role in determining the electrochemical performances of the Li/air batteries. 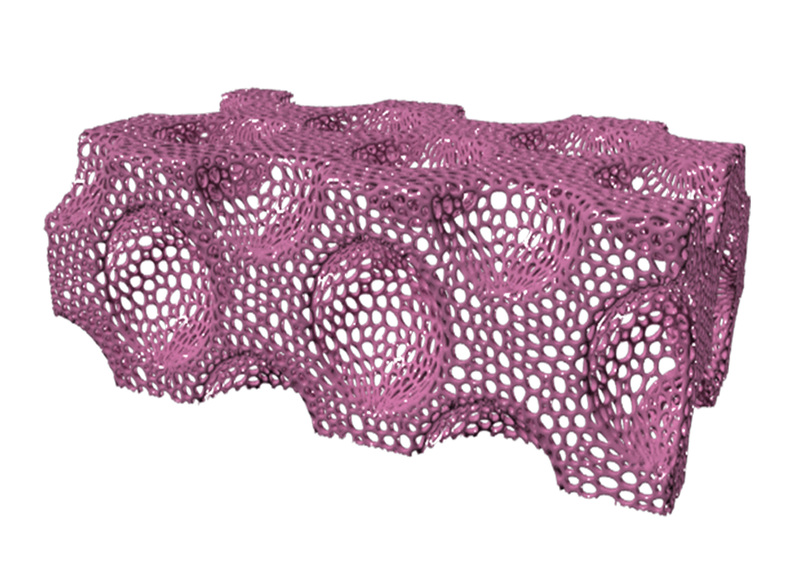 This new surface energy-tailored BCP-based porous membrane features hierarchical multiscale pores that are shaped like honeycombs. Such pores are uniformly distributed over the entire surface of the membrane, allowing lithium ions to flow much freely within it. “These ground-breaking experiements will pave the way towards next generation lithium-ion batteries, exhibiting significantly enhanced performance and increased energy efficiency,” says JungHwan Kim, the lead author on the study. Schematic illustration, showing the fabrication and physical apperance of HMH-BCP membranes. Subsquent solvent-nonsolvent exchange leads to macro/nano-phase seperation to form a highly ordered hierarchical multiscale structure with a dual-porous structure. (A to D): Cross-sectional SEM images showing HMH-BCP membranes with micro/nano pores uniformly distributed over the entire film thickness direction. HAADF-STEM images (F) and EDS analysis (G) show that the entire surface of the thin membrane is covered with G-P4VP blocks. This work has been supported by the IT R&D program through the Ministry of Trade, Industry and Energy/Korea Evaluation Institute of Industrial Technology (MOTIE/KEIT) and the Mid-career Researcher Program through NRF grant funded by the Ministry of Science, ICT, and future Planning (MSIP). 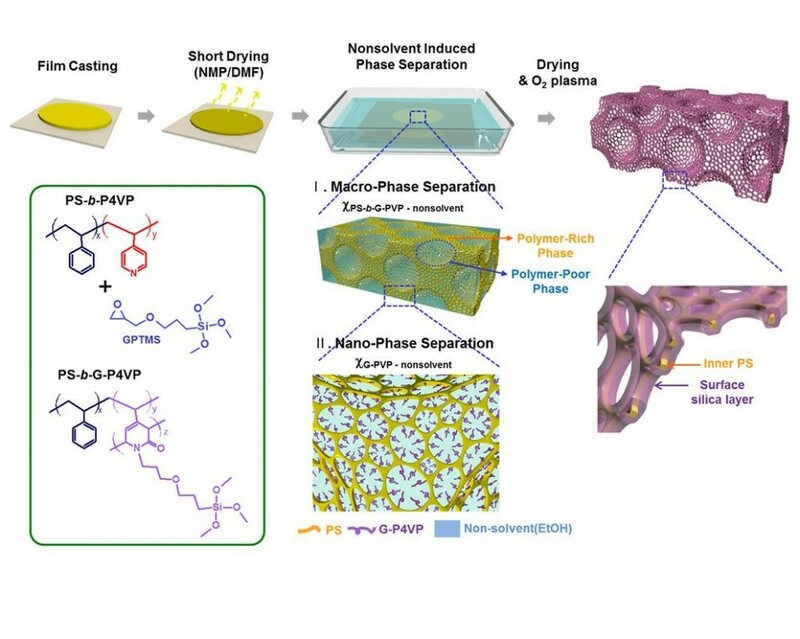 Seungmin Yoo, Jung-Hwan Kim, Myoungsoo Shin, Hyungmin Park, Jeong-Hoon Kim, Sang-Young Lee, and Soojin Park, “Hierarchical multiscale hyperporous block copolymer membranes via tunable dual-phase seperation.” Science Advances Vol. 1, no. 6, e1500101 (2015).